Investigate temperature in relationship to kinetic energy. Equipartition Theorem (java applet) - The kinetic energy of a particle can be due to motion in the x, y, and z directions, as well as to rotations. The equiparition of energy theorem says that the kinetic energy of an atom or particle is, on average, equally distributed between the different modes (different degrees of freedom) available. Identify the characteristics of internal energy and temperature/heat (joules/calories). 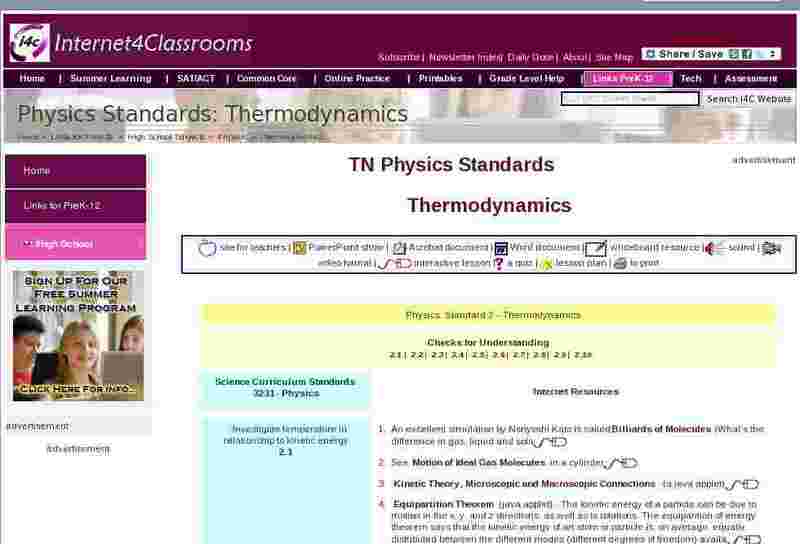 Investigate changes in heat content (quantity of thermal energy) and relate to kinetic energy and specific heat. Investigate potential energy changes (phase changes) of heat of fusion, heat of vaporization, and heat of sublimation [Change in Heat: ?Q= mHv and ?Q= mHv]. Explore thermal expansion and contraction [Linear Expansion: ?l = li a?T ; Volumetric Expansion: ?V= Vi�?T]. Apply the second law of thermodynamics to the Carnot engine. Apply the Laws of Thermodynamics to the atmospheric levels of the earth (i.e., greenhouse effect and global warming). Recognize that absolute zero is the absence of molecular kinetic energy. Relate the First Law of Thermodynamics as an application of the Law of Conservation of Energy and heat transfer through conduction, convection, and radiation. [Heat Lost = Heat Gained, QL= QG]. Relate change in heat content (quantity of thermal energy) to kinetic energy and specific heat [Change in Heat: Q=mC?T].